Are you aged 10-17? Love playing football? Want to play for PJSA with the chance to play for WA? Well Country Week is for you! QBE Country Week organised by Football West and is played over the Sept/Oct school holidays for one week at Beale Park, Spearwood Ave, Cockburn. You will play 2 matches per day and one on the Friday, you will need to attend training for your Country Week team as well as your PJSA team. 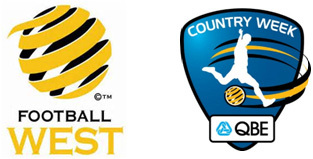 This is an opportunity for players from regional areas to display their Soccer talents on a big stage. Over the years many PJSA players have gained selection in to state regional teams, travelling to competitions in Singapore, Indonesia and other countries. For those not selected they’ve still had an exciting 5 days playing against the best from Albany, Bunbury or Karratha. Country week is free for those selected. At Country Week players will be selected to join the Regional Centre Academy Program (if applicable) and to attend QBE Country Camp, which is traditionally held in the April school holidays which will enable identified players to continue to receive hands on specialist training. Further details are released during the season, or you can contact us for more information.